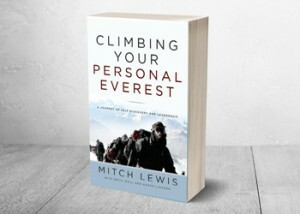 in the exciting new book by Mitch Lewis “Climbing your personal Everest“. Violinist Miha Pogacnik is a modern-day wizard. True, in recent decades, words like that have lost their meaning through misuse and marketing hyperbole. When anyone with something to sell can force powerful language to serve small and ignoble goals, it’s easy to forget that such things as genuine wizardry and magic still exist. Occasionally, however, a person comes along to remind us, and Pogacnik is one of them. Born in 1949 in war-ravaged Slovenia, he is a true master of musical magic — not content simply to entertain or enthrall an audience, or to bask in their praise and applause. As a young man, he achieved all of that, ascending to the top among his peers to become a rising-star soloist, sought after and respected. His path into “greatness” was laid out before him, and traditional “success” was his for the taking. Instead, he walked away and chose a different road. Or, to be precise, he carved his own, brand-new course through the wilderness of limited and limiting options. Since leaving a conventional life behind, he has pursued that elusive “beginning” across a long and winding career, marked by bold action and visionary thinking. The years have forged him, turning him into an alchemist bent on harnessing the mystical power of music to turn the base metals of the present-day human condition into the original, magical gold we all possess, but have forgotten lies within us. It’s a grand mission aimed at nothing short of the social and cultural transformation of the world. To grasp the nature of Pogacnik’s twenty-first-century work — what he refers to as his “fourth life” — imagine yourself in his “laboratory.” Picture a broad stage where all the skilled musicians in a philharmonic orchestra are seated in curved rows, instruments at the ready, eyes on their conductor and soloist. Feel the breathless anticipation in the sudden silence as Pogacnik lifts his violin bow, all the potential energy of a musical masterpiece waiting for release. The music begins, and a galaxy of dancing sound appears in the room. Yet in this scene you don’t play the role of detached observer looking down from the balcony. You are embedded in it, seated in a row of chairs placed between the stringed instruments and the woodwinds. You feel the vibrating frequencies of music caress your skin through the air and rumble in your bones as it rises out of the floor. Your heart expands with emotion until you fear you’ll burst. The music is a buoyant force that nearly lifts you free of gravity itself. The picture isn’t complete, however, until you look to your left and right and see the true purpose behind the gathering of musicians. Without this, the entire exercise is just another performance of timeless music — marvelous, perhaps, but without the full potential for the kind of alchemy Pogacnik seeks to create. Because seated beside you are a number of high-ranking executives from some of the world’s largest and wealthiest corporations. These are powerful men and women, decision-makers, whose actions every day have profound influence over the lives of millions of others — trillions, if you include the non-human creatures with whom we share the planet. They sit in boardrooms and back rooms around the world and literally chart the future of humankind through the values they express in their choices and priorities. Pogacnik believes society has lost sight of a fundamental truth — that the world’s economy must exist to serve the needs of the people, not the other way around. His remedy is to confront the “anomaly of one-sided economic thinking” with an alternative way of seeing, found in the power of great art to restore equilibrium. To do that, he goes straight to the top of the corporate chain of command. That sweeping vision has humble roots in the industrial city of Kranj, Slovenia. In 1952, Pogacnik was three years old, in a nation still suffering the aftermath of World War II and coming to grips with the new reality of belonging to the post-war Soviet Bloc. Modern entertainments like television were non-existent, but each weekend the family would walk for the better part of a day into the mountains for traditional celebrations of music and food. Pogacnik instantly began making music of his own — but with a twist. Not knowing better, he held the instrument backward, consequently learning to play the melody with his left hand instead of the right. A few years later, his would-be music teachers noticed this fact and understood that it gave him a head start in learning to play another instrument that would become his lifelong passion: the violin. That story would also instill in him a deep appreciation for the wisdom of trusting the often-unexpected magic in the twists and turns of life. “Violin came to me by mistake, not by knowing violin or aspiring, but by the mystery of the mistake in life,” Pogacnik says. His first teacher excelled at instilling enthusiasm, he says, but did a lousy job of conveying good technique. Even so, by the time he was six years old, Pogacnik had already won regional violin competitions. At age eleven, he was sent to the big city of Maribor to compete — and heard a “real violinist” for the first time in his life, someone who truly understood the magic in the music and was passionate about getting it right. It turned out that practice and mastery weren’t the only “impossible” things Pogacnik would have to reach for. Quickly realizing he wanted more than his current teacher could deliver, he announced his intention to travel to the nearby city of Ljubljana to study with someone else. It didn’t matter that his teacher responded by throwing a music stand or that his otherwise supportive parents locked him in his room. He climbed out the window, made the trip, and was accepted into the school. For two years, he went twice a week by bus for the opportunity to learn. His first teacher there began the work of undoing all of his bad habits. This radical path led him out of the East to Cologne, Germany, at age seventeen to study music on a prestigious scholarship for foreigners — then to the United States at twenty-four as a Fulbright Scholar. To become a soloist in the world of classical music is the dream of thousands of gifted performers, the pinnacle of success. By his late twenties, Pogacnik had captured the prize, well on his way to a long career among the elite musicians of the world. It was a stunning achievement for a boy from an isolated country who learned to play the wrong way on a paper accordion. It was also a source of deep internal crisis. It set the stage for a moment of decision that would cost him everything — and also, in magical fashion, deliver everything he has since come to value. What bothered him most was the self-serving nature of the entire structure. It offered no opportunity, he felt, to step outside the confines of the system “in order to become an element of social change, to really reach the situation in which the world has gotten itself.” He knew that music had much more to offer than the status quo would allow — because he believed that it literally was much more than lifeless frequencies vibrating in the air. He knew it was magic. So he turned his back on the life of comfort and prestige that all his hard work had earned him. He set out on a quest to be a musician of the highest quality he could possibly attain — and an agent of needed change in the world. The first leg of the journey took Pogacnik in an unexpected direction — to a place that became for him a classroom of preparation for everything that would follow. He was invited to teach music at the Camphill Village Residential Community for adults with developmental disabilities. Founded in 1961 on 615 acres in upstate New York, the organization was part of a growing American movement to challenge how society treats people with special needs. Though he didn’t know it at the time, that mission fit perfectly with his desire to create a model for music performance that invited audiences to do more than simply listen for intellectual stimulation. He wanted to make them deeply feel the music. To meet this challenge, Pogacnik discovered anew how to be fully present when he played, to go beyond performance and become a “phenomenologist” — someone who studies the relationship between human consciousness and experience. The key idea in this philosophical discipline is that experience is intimately intertwined with intention and self-awareness. And it worked. A bond was created between him and his so-called “handicapped” audience that transcended anything he’d experienced before. “That created an opportunity for people to start looking at the role of art in inner human development, spiritual development, which can be supported by immersing oneself deeply into the great arts,” he says. And it opened the door for what Pogacnik calls his first “little festivals” — one-day events aimed at testing a bold idea: could he create a new kind of concert that involved his audiences as partners, not spectators, in crafting a musical experience? It’s a question that he has spent his life attempting to answer. In April 1981, he held the first of many music festivals at the Chartres Cathedral in Chartres, France. In 1983, in the shadow of heightened Cold War tensions — when Europe was in turmoil over the deployment of U.S. Pershing missiles on German soil — Pogacnik organized a festival in his home country of Slovenia. It was the first of its kind since the Iron Curtain had descended across the continent — and drew eight hundred people from Western Europe who travelled there to attend. From there he organized weeklong festivals in Budapest, Prague, all over East Germany and the Soviet Union. Everywhere he went, concert halls were packed with locals and westerners alike, enabling a powerful grassroots cultural exchange. All of it involved hours and hours of work and expenses that seemed to only be met by magic. But he never stopped thinking big. One trip involved renting seven ships and visiting towns all along the coast of Yugoslavia during the bloody war in the 1990s. Another filled a Trans-Siberian railway train with musicians and other cultural thinkers for a three-week long journey from Berlin to Ulan Bator in Mongolia. In 1989, the fall of the Berlin Wall changed everything — yet again — for Pogacnik. Overnight, the ideals of freedom and cultural cooperation that had fueled his festivals across Eastern Europe were replaced by a singular force: capitalism. A stark example of this fundamental shift came in Dresden, East Germany. Before the wall fell, Pogacnik gave a concert there in a hall packed with people hungry to immerse in the music. A year later, in the same place, only a handful showed up. It was a wake-up call revealing a new reality and the challenge inherent in the composition of this new world: How to form an economy that exists to serve the people, not the other way around. Above all, Pogacnik still believed the answer lay in music and the other great arts. In perhaps the hardest life transition of all, Pogacnik abandoned the festivals he had worked so hard to create over the years — “threw them in the dust,” as he likes to say. He started over, not to oppose capitalism and its leaders, but to speak to them through the medium of music, to inspire them to see past the bottom line. It’s not easy work, nor is it easy for those who are touched by his message. At heart Pogacnik has never stopped being a radical, and he pushes others to the radical life as well, come what may. In other words, he says, don’t be afraid of the kind of inspiration that burns down all that you think you know, so that something new can take its place. Don’t be afraid to reinvent yourself as many times as it takes to follow your dream.